Foxtronics Rampguard Aircraft Security System Motion Detector. 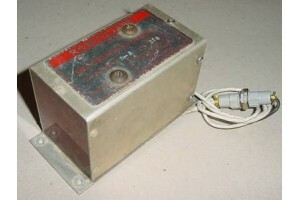 Model MD-320. P/N 660-0008-002-A. Foxtronics "Rampguard" Aircraft Security System Motion Detector. Model MD-320. P/N 660-0008-002-A. Installed on Raytheon aircraft models: BAe.125 Series 800A (C-29A), BAe.125 Series 800A (U-125), BH.125 Series 400A, DH.125 Series 1A, DH.125 Series 1A/R-522, DH.125 Series 1A/S-522, DH.125 Series 3A/RA, DH.125 Series 400A, HS.125 Series 600A and HS.125 Series 700A. Very clean item. Condition, as removed. Lists for over $1000! !